PRODUCT: #9550 Heavy-Duty Solid-Steel Utility Rack for 5-Gallon Paint Cans. Will also fit some Water Coolers. 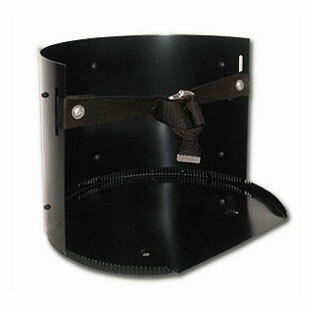 With Adjustable Cinch-Buckle Strap and Rear Wall Mount Bracket. Made in USA. Price/Each. POPULAR APPLICATIONS: Fits most 5-gallon paint buckets and (depending on the diameter of the base) 2-gallon water coolers including Igloo models 421, 321, 621, 331, 631, 3351, 321521, and 3315. Bottom Outside Diameter: 11-1/2" in diameter. Belt: 1-1/2" wide, 2 piece locking. Rear Bracket is 10-1/2 wide with 3/4" L mount. Bottom of the belt slot: About 6" from the base. The steel thickness including coating of all components is about 0.052". Maximum item diameter which can be safely held is 10-3/4". Constructed with solid heavy-gauge .052" cold rolled steel which is powder coated with a weather resistant coating. Heavy poly web strap securely holds full containers in place, even during rough travel. Steel strap latch is zinc coated.